Michael Washington Hill had 20 points and six rebounds to lead the Technicians. Kalil Whitehead had 19 points, seven rebounds, and four steals in the championship game. Daniel Autry had 15 points. Tyson Acuff added eight points and nine rebounds. Anthony Kyles had seven points in the win. Detroit Cass Technical -- 2019 PSL boys basketball champions. Detroit Central's Bentis Hayes (12) scores against Detroit Southeastern on Saturday. Detroit West Side Academy's E. James (2) scores against Detroit Davis on Saturday. Detroit Mumford's Joshua Moore (21) scores against Detroit Denby on Tuesday. Detroit Detroit Collegiate Preparatory at Northwestern's Steve Pearson dunks on Tuesday. Detroit Martin Luther King's Jordan Whitford (3) drives to the basket Saturday against Detroit Henry Ford. Detroit Pershing's Emmanuel Williams (12) scores against Detroit Mumford on Saturday. Detroit Cass Technical's Kalil Whitehead (13) scores against Detroit Communication & Media Arts on Saturday. Detroit Renaissance's Kaylein Marzette (5) drives to the basket Saturday against Detroit Collegiate Preparatory. Detroit Renaissance's Chandler Turner (3) scores against Detroit Martin Luther King on Tuesday. Detroit Cass Technical's Christopher Jones (23) dunks against Detroit Pershing on Tuesday. Kalil Whitehead scored 19 points and grabbed nine rebounds for the Technicians. Tyson Acuff had 16 points, four rebounds, and four assists. Michael Washington Hill had 14 points, five rebounds, three assists, and three steals. Chandler Turner scored 12 points to lead the Phoenix. Kaylein Marzette scored 11 points and grabbed eight rebounds. Juwan Maxey had 10 points and Keon Henderson had eight points. Kalil Whitehead led the Technicians with 15 points. Daniel Autry scored 14 points. Tyson Acuff had 11 points and Michael Washington Hill, Kaelen King and Josh Harris each added seven points. Emmanuel Williams led the Doughboys with 27 points and six steals. Tharron Hill scored 14. Paire Hill added 12 points. David Solomon scored seven points and grabbed six rebounds and Brian Woodland added six. Jordan Whitford led the Crusaders with 22 points, four assists, and three steals. Rayshawn Cowan had 10 points and four rebounds. Chancey Willis Jr. added nine points and John Massey Jr. finished with eight points and five rebounds. Chandler Turner led the Phoenix with 25 points, nine rebounds, five assists, two steals, and three blocks. Kaylein Marzette scored 24 points. Kylin Grant had 12 points, nine rebounds and five assists. Keon Henderson added 11 points. Tyson Acuff had 11 points, 10 assists, six rebounds and five steals, and Anthony Kyles, Daniel Autrey and Kalil Whitehead each scored 11 for the Technicians. Damon Terrelle had 18 points, 14 rebounds and four blocks, Staphon Marzette 11 points, five assists and six rebounds and Jeremiah Henderson nine points for the Pharaohs. Alan Gee Jr. had 28 points and 13 assists and Miquan Terry 11 points and 13 rebounds for the Mustangs. Pierre Hill scored 24, Reggie Lawrence 17 and Tharren Hill 13 for the Doughboys. Steve Pearson scored 18, Durron Gray had 15, and Kash Williams scored 12 for the Colts. Chandler Turner led the Phoenix with 23 points and nine rebounds. * Detroit Edison Public School Academy, a charter school, was a member of the Detroit Public School League for two years (2016-17 and 2017-18) and is currently an independent. 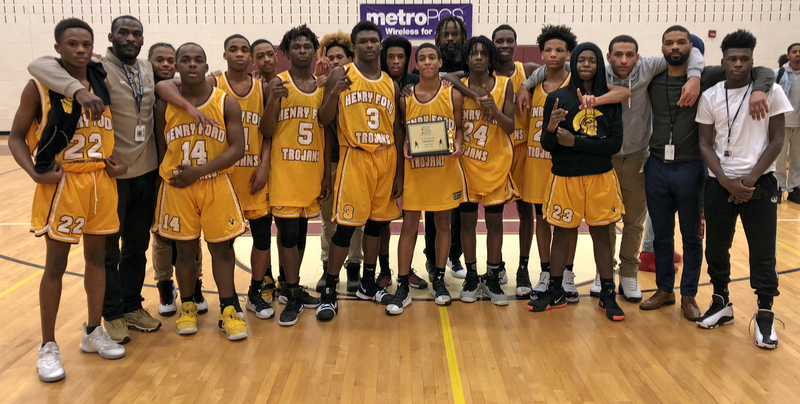 Mario Hill scored 16 points, Ahmed Ford had 13 points, Christian Green had 11 points, and Charles Banks scored 10 to lead the Trojans to the junior varsity championship. Detroit Henry Ford players and coaches pose with their PSL junior varsity championship trophy on Thursday.